Is glorifying Tipu Sultan justified. The truth about what he had done in the Malabar region had been veiled in History text books. The major part of Tipu Sultan’s rule was spent in conducting military operations for subjugating Malabar. 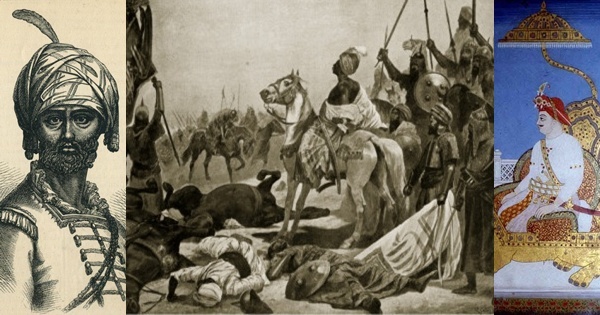 Wars of territorial conquest waged in Malabar by Hyder Ali Khan, with the assistance of Ali Raja of Arackal and his Mappila followers of Cannanore, were intended more for spreading the Islamic faith by killing and forcible conversion of Hindus , than for expanding his kingdom. His atrocities were coupled with widespread destruction of Hindu temples. Hyder Ali Khan had expressed his satisfaction for these cruel achievements. A broad picture of atrocities committed against the Hindu population of Malabar by the army of Hyder Ali Khan can be had from the diary notings of a Muslim officer of the Mysore army as edited and published by the then surviving son of Tipu Sultan, Prince Ghulam Muhammed (Cited in Malabar Manual, William Logan). Before his efforts to conquer the entire Malabar region could succeed, Hyder Ali Khan died in December, 1782. Tipu Sultan who succeeded his father, considered it his primary duty to continue this unfinished task. However, the Islamic fanaticism of Tipu Sultan was much worse than that of his father. His war-cry of jihad was ‘Sword’ (death) or ‘Cap’ (forcible conversion). This makes very clear the character of Tipu Sultan’s military operations that started in 1783. The intensity and nature of sufferings which the Hindu population had to bear during the nightmarish days of Padayottakkalam (military regime) were vividly described in many historical records preserved in the royal houses of Zamorin and Kottayam (Pazhassi), Palghat Fort and East India Company’s office. There is no apparent reason to disbelieve them. It is absurd and against reason to describe all this evidence as being forged for the purpose of creating enmity between Hindus and Muslims (as presumed by Dr. C.K. Kareem and others). During the cruel days of Islamic operations from 1783 to 1791, thousands of Nairs besides about 30,000 Brahmins had fled Malabar, leaving behind their entire wealth, and sought refuge in Travancore State (according to the commission of enquiry appointed by the British soon after Tipu Sultan’s death). So far as the history of Malabar region is concerned, the most dependable book for basic historical facts is definitely the Malabar Manual written by William Logan. Serving in various administrative positions including that of a Collector for 20 years upto 1886, he had gone through and extensively researched a variety of documents for preparing his well-acclaimed book. The present edition has been scrutinized, edited and published by the reputed Muslim historian, Dr. C.K. Kareem, with the support of Cochin and Kerala universities. Therefore, the authenticity of its contents cannot be doubted. There are plenty of references in the Malabar Manual about the cruel military operations and Islamic atrocities of Tipu Sultan in Malabar – forcible mass circumcision and conversion, large-scale killings, looting and destruction of hundreds of Hindu temples, and other barbarities. Since the same Congressman admitted that Tipu had not discriminated between Hindus and Muslims in Mysore and administered his country well, his observations about Kerala could be accepted as impartial comments. In 1789, Tipu Sultan marched to Kozhikode with an army of 60,000 men, destroyed the fort, and razed the town to the ground. Gundart says in his Kerala Pazhama that it is just not possible to describe the cruel atrocities perpetrated by the barbarian Tipu Sultan in Kozhikode. “Kozhikode was then a centre of Brahmins. There were around 7000 Namboodiri houses of which more than 2000 houses were destroyed by Tipu Sultan in Kozhikode alone. Sultan did not spare even children and women. Menfolk escaped to forests and neighbouring principalities. Mappilas increased many fold (due to forcible conversion). Atrocities committed in Malabar during the days of Tipu Sultan’s cruel military regime have been described in great detail in the famous works of many reputed authors-Travancore State Manual of T.K. Velu Pillai and Kerala Sahitya Charitam of Ulloor Parameshwara Iyer. Is it not absurd to condemn what all these respected authors have written about the atrocities of Tipu Sultan and label it as a deliberate attempt to defame him? All the historical documents of that period clearly indicate that Tipu Sultan’s attack on Malabar had some purpose other than simple territorial conquest. That purpose was to Islamicise the whole of Malabar by forcibly converting all the Hindus there. Featured image courtesy: Wikipedia, columbia.edu, and Pinterest.